Ikpehare Aig-Imoukhuede, Sylvanus Egbuche, Pius Oleghe, Nathaniel Oyelola, Muyiwa Awe, Ralph Opara. To ensure the fraternity was non tribal and non nepotistic, the founders came together from different ethnic groups that made up Nigeria as seen from their names. This simply because tribalism and nepotism in Nigeria, at the time and now, facilitated by easy identification associated with names has always been an issue, even in our polity. The Pyrates confraternity became a registered organisation in 1980 after it was duely registered with the Nigerian Federal Ministry of Internal Affairs under the Land (Perpetual Succession) Act Cap 98 with the name "National Association of Seadogs” RC No 1592. 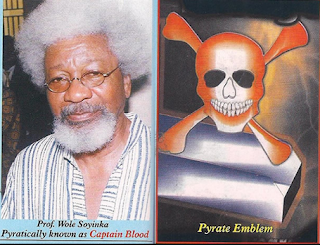 Some notable members of the pyrates fraternity today are veteran nollywood actor; Sam Dede, media mogul; Dele momodu, Dotun Jackson Olukoya. To qualify as an initiate into the Pyrates confraternity you must be an Undergraduate in a tertiary institution of learning. The confraternity holds its initiation yearly. Download "Pyrates Confraternities" bid Farewell to Chuma George Odenigwe, 8/30/2013!